Have switched to Active Campaign from Mailchimp by the time we had 1800 email accounts. I liked the big variety of automation events and the newly developed very simple sales CRM module which is appropriate for small business. I still like the interface style of Mailchimp more, but with Active Campaign for the same money I get more features and functionalities, and in the top pricing plan, there are even more features I am not familiar with today… Which I like most is the top customer service I get from Active Campaign via Skype, phone, live chat or email. Somehow they really make me feel supported by them. Automation A bit editor heavy for those not used to creating templates, but with the right help it makes life much easier. I have used several email marketing systems and Active Campaign is my favorite to work with for my small business owners. It has automation included in every package, integrates well with other systems so that internal reminders and external emails can happen in one workflow. Great for small business owners that have digital products as well. A bit editor heavy for those not used to creating templates, but with the right help it makes life much easier. I have used several email marketing systems and Active Campaign is my favorite to work with for my small business owners. It has automation included in every package, integrates well with other systems so that internal reminders and external emails can happen in one workflow. Great for small business owners that have digital products as well. The marketing automation in Active Campaign is good. You can automate a lot. Once you get used to the logic of the platform. After using OntraPort and InfusionSoft the logic is just different. The way AC labels things because they are still using lists. One thing I found with their campaign builder is that it takes quite a long time to respond. It’s not the fastest workflow. While it looks good, there isn’t much of an advantage using the diagram layout over a linear programming. At the end, the linear workflow of OntraPort is faster and more responsive. Pros: The entry point pricing is good for the amount of features you get. It’s pretty easy to get in-depth customer and prospect information, including social data. But you have to pay for it. The campaign builder is slow in response. The more complex an automation campaign gets the slower the responsiveness. Deliverability isn’t the best. Lack of SMTP supports to fulfill emails via SendGrid or Amazon SES which could improve the deliverability a lot. If you are contemplating the highest price point, contact OntraPort about their starter plans. The marketing automation in Active Campaign is good. You can automate a lot. Once you get used to the logic of the platform. After using OntraPort and InfusionSoft the logic is just different. The way AC labels things because they are still using lists. One thing I found with their campaign builder is that it takes quite a long time to respond. It’s not the fastest workflow. While it looks good, there isn’t much of an advantage using the diagram layout over a linear programming. At the end, the linear workflow of OntraPort is faster and more responsive. Pros: The entry point pricing is good for the amount of features you get. It’s pretty easy to get in-depth customer and prospect information, including social data. But you have to pay for it. The campaign builder is slow in response. The more complex an automation campaign gets the slower the responsiveness. Deliverability isn’t the best. Lack of SMTP supports to fulfill emails via SendGrid or Amazon SES which could improve the deliverability a lot. If you are contemplating the highest price point, contact OntraPort about their starter plans. Marketing automation tools and templates Deliverability excellent in our experience CRM was enough for our needs, helping coordinate 5 staff. Can use in Gmail, which helped our non-Tech sales people. Reporting that helps quantify engagement and ROI CRM was not the strongest, yet enough for our needs Marketing automation services generally are separate from emails you send to larger lists in my approach. Would like an option for sending mail outside the automation to lists, but that may simply be different skill sets (haven’t found a solution we like). Setting Activecampaign for a client with a limited budget and limited technical skills, we were able to set up and automate many of the lead funnels for this B2B SAAS company. The tools are comparable to what you’ll pay 10X for, and one of the features I love about Activecampaign are their Marketing Automation Workflows – allowing you to setup, segment, and activate the inactive. By using this tool, we achieved 25% open rates in the HR industry where 10% is often average; by integrating the online tools with our inbound marketing Team – both phone and online support – we were able to increase sales Demos 10X over the previous 6 months because Activecampaign helped us motivate the inactive, as well as those who take action.One of the tools I recommend most to clients is Activecampaign because it’s performance marketing at a reasonable price. Learn this tool; it can literally set up a small business on autopilot for initial inquiries, helping you figure out what’s working and what’s not.Lead scoring tools are rarely used, but should be regardless; you’ll know more about your audience using Activecampaign – their tracking of visits to the site helped us improve funnels and spot weaknesses quickly, and adapt. CRM was enough for our needs, helping coordinate 5 staff. Can use in Gmail, which helped our non-Tech sales people. Marketing automation services generally are separate from emails you send to larger lists in my approach. Would like an option for sending mail outside the automation to lists, but that may simply be different skill sets (haven’t found a solution we like). Setting Activecampaign for a client with a limited budget and limited technical skills, we were able to set up and automate many of the lead funnels for this B2B SAAS company. 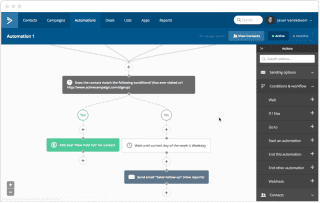 The tools are comparable to what you’ll pay 10X for, and one of the features I love about Activecampaign are their Marketing Automation Workflows – allowing you to setup, segment, and activate the inactive. By using this tool, we achieved 25% open rates in the HR industry where 10% is often average; by integrating the online tools with our inbound marketing Team – both phone and online support – we were able to increase sales Demos 10X over the previous 6 months because Activecampaign helped us motivate the inactive, as well as those who take action.One of the tools I recommend most to clients is Activecampaign because it’s performance marketing at a reasonable price. Learn this tool; it can literally set up a small business on autopilot for initial inquiries, helping you figure out what’s working and what’s not.Lead scoring tools are rarely used, but should be regardless; you’ll know more about your audience using Activecampaign – their tracking of visits to the site helped us improve funnels and spot weaknesses quickly, and adapt. I’ve used Active Campaign for a while now and I really like how easy it is to get started with it. It takes away of lot of manual tasks but automated the sales workflow and even the onboarding of our customers. If you have a sales team which is out trying to close deals and doesnt want to deal with paperwork then the Automations feature of active campaign can do it all for you. ActiveCampaign was founded in 2003 by Jason VandeBoom as a solution for business owners to keep in contact with their customers. Initially, the company offered several solutions for purchase but switched to an SaaS model as the industry changed. Although small, the company has been profitable since its founding year; in 2016, ActiveCampaign accepted $20 million in private funding for the first time as its employees grew from fourteen employees to over seventy-five. ActiveCampaign is particularly effective for small to midsized businesses that seek effective email marketing tools with the potential to go beyond that – automated marketing campaigns and customer retention. In 2014, its average customer was a company with one to five employees; now, the average ActiveCampaign customer has twenty to eighty employees. ActiveCampaign is based in Chicago, Illinois. Its revenue in 2014 was more than $10 million. 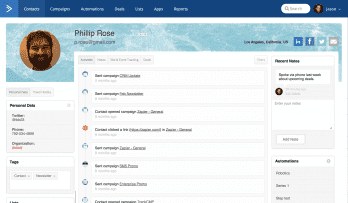 ActiveCampaign offers three subscription tiers – Lite, Small Business and Enterprise. Each has flexible pricing based on your number of contacts. The Lite plan pricing can be scaled down to 500 contacts, while the Small Business and Enterprise plans can be priced for 1,000 contacts. Users can subscribe to month-to-month plans with no contract or setup fee and the ability to cancel anytime. Paying upfront for an annual plan yields a 15% discount, and non-profit organizations are eligible for a further 20% discount. ActiveCampaign offers an Enterprise plan but its features, pricing and subscription model is all geared towards small to midsized businesses. The platform offers considerable functionality, especially for its price, a highly intuitive user interface welcoming the uninitiated, helpful notifications to build properly-functioning workflows and the ability to subscribe or cancel your plan with no setup costs or termination fees. The cheapest plan, Lite, can be used for up to three users for only $9 per month – far below any other marketing automation vendor. ActiveCampaign also offers a free trial, which many of its rivals in the marketing automation space don’t do. All that points to a solution that aims to ease users into marketing automation. What about the quality of features? As mentioned, they’re useful for the price, but they can accomplish a fair bit in their own right. 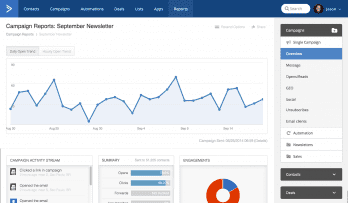 ActiveCampaign’s email marketing and newsletter features include a drag-and-drop interface, email triggers, templates, image hosting, A/B testing, dynamic content and responsive design. Contacts and leads can be segmented by contact data, campaign interactions, website activity and demographic information for targeted campaigns and automations. ActiveCampaign also tracks email and website activity for real-time interaction insights and reports for trends and campaign performance. The marketing platform includes a CRM with sales automation. The CRM includes an activity timeline, drag-and-drop sales pipelines, contacts’ profiles augmented with social and behavioral data and automations. ActiveCampaign offers integrations with over 150 third-party applications ranging from CRMs, developer tools, content management, analytics and more. Its Small Business and Enterprise plans offer one-on-one training and in-depth onboarding, respectively, and its online resources include a knowledge base with training articles and video guides and community forums. 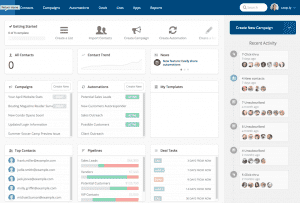 Overall, ActiveCampaign is a credible, capable marketing automation solution at an astonishingly fair price. Whether you’re a marketing newbie getting your feet wet or an established business seeking a scalable, low-cost yet nimble and powerful tool, ActiveCampaign delivers the goods and helps you along in a format anyone can understand. What Do You Think of ActiveCampaign?